Hardly a month in power. the French Socialists are trying to come to grips with the announcement of mass layoffs in auto industry. One of the main reasons the Socialists took power in France this year was the failure of the previous conservative government to combat unemployment. Not only did the Socialists promised to do better, but they set up a new ministry to re-industrialize France. Now less than a month following the takeover, French automaker PSA Peugeot Citroen, citing losses of €100 million a month, has announced the firing of 8000 workers. The manufacturer claims that the European market for vehicles has contracted by 23% since 2007 and is expected to contract by an additional 8% this year. The economic difficulties of Spain and Italy-- two of the company's principal markets - have compounded the problem. The immediate reaction was to blame the former government, although Nicholas Sarkozy pumped in billions to sustain and revitalize the French auto industry. Politically, this tactic can work. After all, if Barack Obama who has almost completed a full term of office can still blame George W. Bush, the Socialists, after a month, are even more entitled to blame the UMP. Everybody reacted as expected. 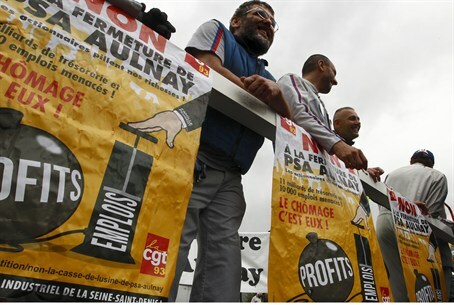 The French CGT union, allied with the Communists, attacked the Socialists for failing to take drastic action and slammed the company for receiving generous government assistance and repaying the assistance with massive layoffs. Re-industrialization Minister Arnaud Montebourg, who represents the left wing of the Socialist party, announced "we do not accept (Peugeot's] plan" and appointed an expert to study the financial situation of the group. "We are demanding that PSA loyally examine all the other solutions." The European Commission says it is too early to decide whether France will be able to tap a fund that is intended to compensate countries for the ravages of globalization, because it is not certain that globalization is the problem. The Secretary-General of the opposition UMP, Jean-Francois Cope, while promising solidarity claims that the situation illustrates the root problem of French competitiveness - or rather lack of it. The cost of labor was simply too high and France had to learn from Germany. National Front leader Marine Le Pen, continuing the anti-globalization line that she had emphasized during the presidential and legislative campaigns. called on the government to support French industry "while protecting it from international competition." She called for import quotas to be imposed to salvage the French auto industry.